We dipped our toes in the water with Bianchi last year, but it was only this year that the stars seemed to align. The brand has become one of our very favourite in store, and we have been incredibly lucky to be able to do some cracking builds. I have demo'ed a Specialissima on three occasions, the most recent was when I took it to our Cote d'Azure trip. 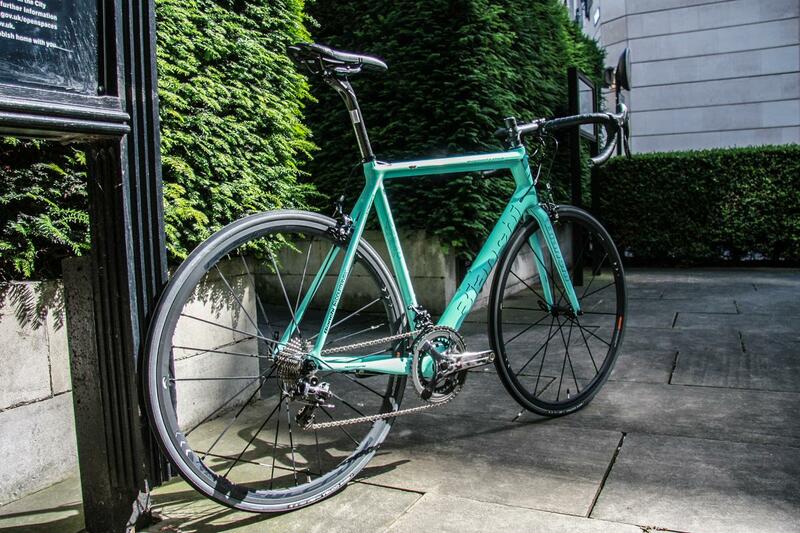 I liked the bike so much I asked to buy one from Bianchi. Often Italian bikes are all mouth and no trousers; lots of flash paint and wavey tubes, but where is the R&D and engineering? There has been a revival in Italian bikes over the last five years though, marrying the technical process of the bigger boys with a design flair that the Italians are untouchable at. 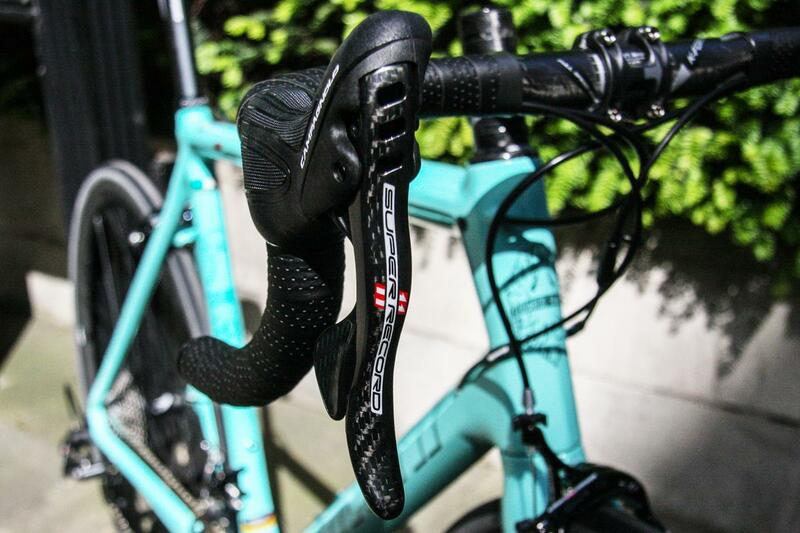 Bianchi have three main Pro models. 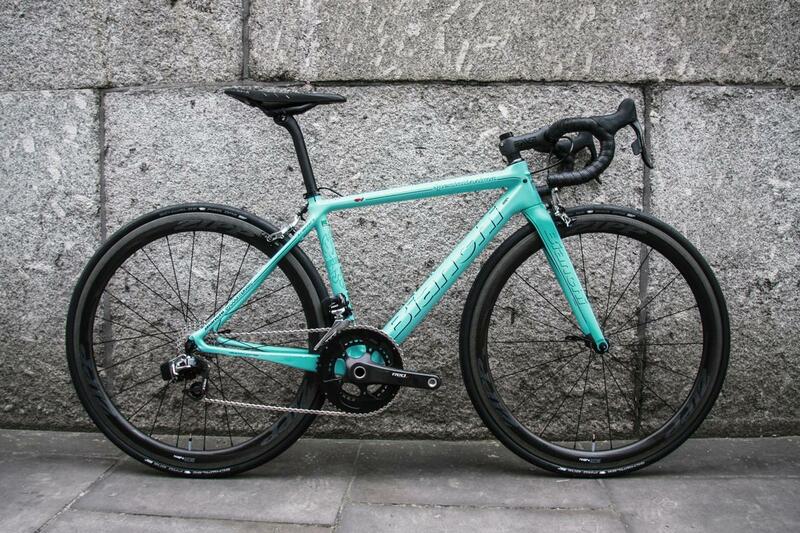 The Oltre XR4 is Bianchi's aero road bike to compete with the Madone and Venge. The Infinito is their cobbled sportive bike, and the Specialissima is their lightweight, Alpine race bike. 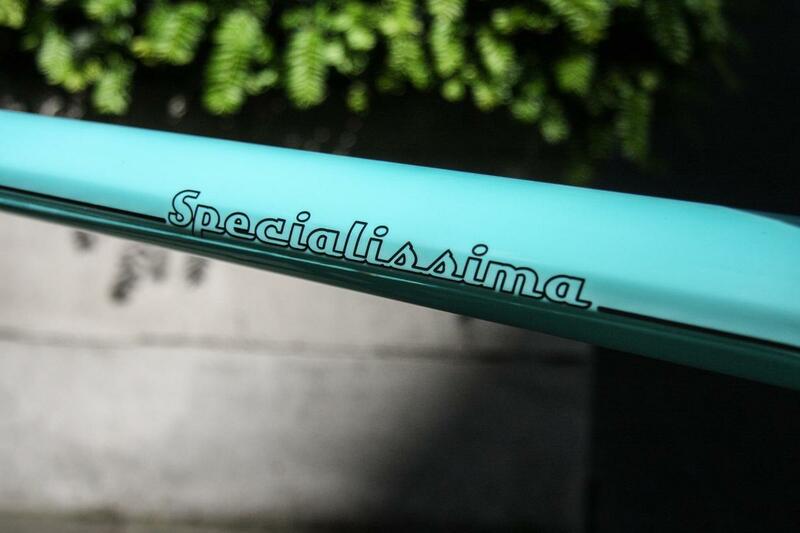 The Specialissima is just a cracking bike - it's become a modern classic. It just feels very balanced, the sort of bike that is fantastic on a European sportive because it can do it all. 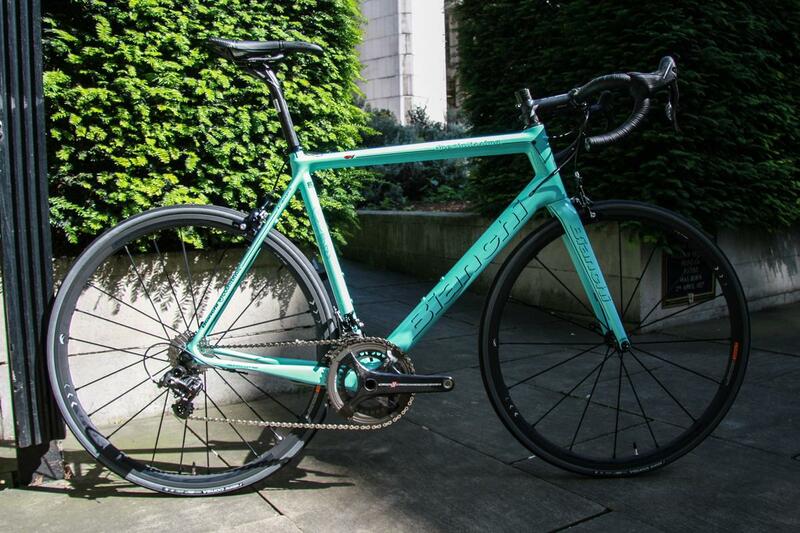 Every Bianchi we have sold has been a frame only build. We have not done a complete bike with them as we prefer complete control over the specs. However I thought "my bike" was a great chance to try a complete bike. We decided that it should be the full Campagnolo Super Record spec, which comes wth FSA carbon finishing kit and Fulcrum Racing Nite wheels. That was an easy decision. Far harder was which colour. There are three stock colours and also a custom paint programme (which adds £400 and is very popular). Colour IE is a matte black with celeste logos. Pictures don't do it justice - it looks absolutely amazing in the flesh. If I did not have so many black bikes I would have gone this route in a heart-beat. 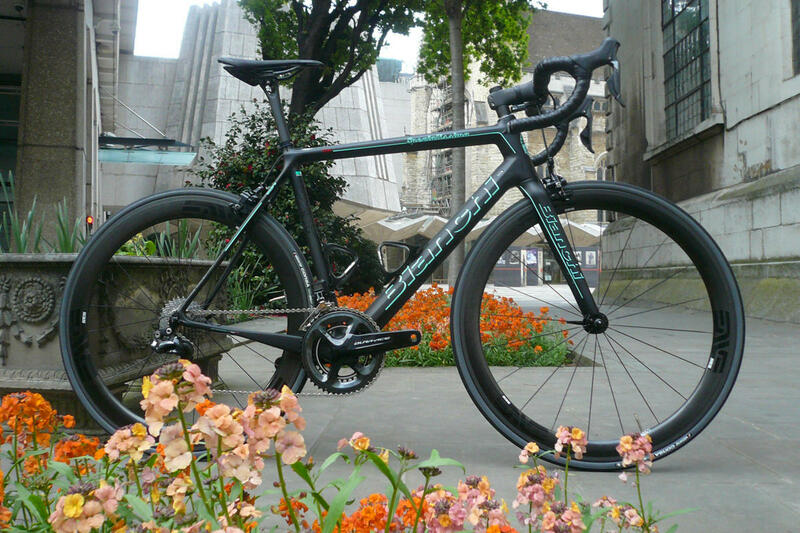 Celeste is the classic Bianchi colour and you can have it in matte or gloss. I think matte celeste looks immense, but is a pig to keep clean, and given I am a messy pup, and that this bike will be a demo bike as well, it made sense to go glossy. 10 years ago I was the biggest Campag fan-boy. Record 10 speed verus the clunky looking Shimano 7800 (with those ghastly cables) was no comparison. I was drinking the 'ShimaNO' and "Shimano wears out, Campy wears in" Kool-aid. The tide began to change with Shimano 7900 and especially with Di2. Di2 verus Gen One EPS was just embarrassingly one sided. And then SRAM got competitive and it become more difficult for Campag still. 10 years ago 70% of our builds were Campag; now its less than 10%. But what we don't do in quantity we do make up in quality; they are all very special builds indeed. I am not a good enough rider to tell the difference between Shimano or Campag crank stiffness. Nor, truth be told, do the brakes feel massively different. Both are Pro Tour level quality. The big difference, and it's the first thing you 'feel' is the ergo hood shape and the shift mechanism. Campag levers have always been sublime; the shape is perfect. The shifting is surprisingly agricultural though. It comes as a bit of a shock after the butter smooth shifts of Dura Ace. But a couple of rides is all it takes to get used to its idiosyncracies. A question that has raged for 15 yrs. It's a similar one to Cannon or Nikon in SLR Cameras. And it has the same qualifiers, so they are captive to the brand in a sense. I personally think Dura Ace is the more 'complete', but it's a close run thing. Campag certainly has a romance about it Shimano can never match. It also looks beautiful; those hood shapes and that carbon rear mech is simply sublime. 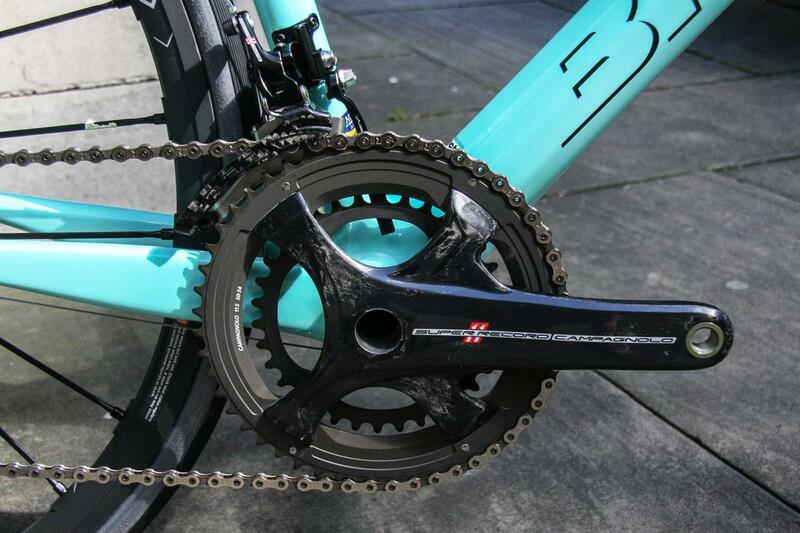 See more photos of this beautiful Bianchi Specialissima here.